Plum Pie New York Times - the best recipe! Plum Pie New York Times - a legend :) They say the recipe American housewife from year to year were asked to repeat the editor of New York Times, as advancing "plum season." It lasted for more than ten years now, no one will say for sure: truth or fiction. One thing is clear - the cake turns out great! It is this recipe, I took as a basis, slightly modify it. The cake turned out just amazing, be sure to try to cook it with three kinds of flour - a fantastic combination, you will not regret! 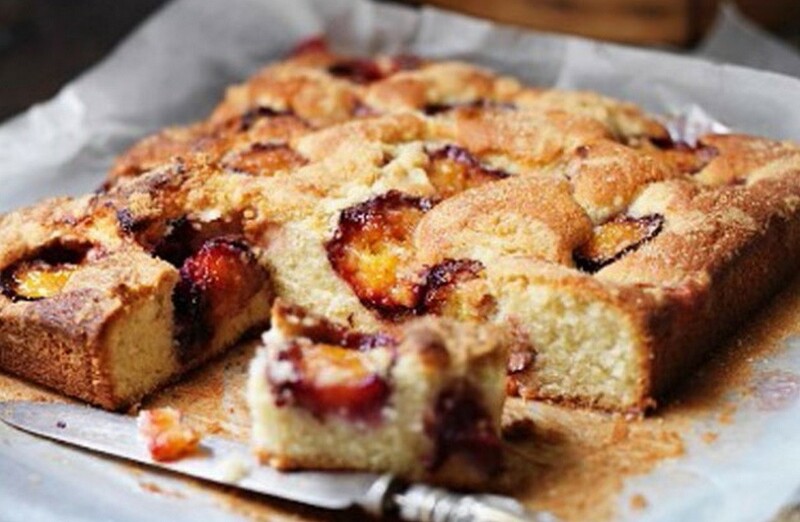 Generally, of course, plum perfectly complements any pastries, this is difficult to disagree. But in combination with coconut flour, lemon peel and cinnamon - it's a blast! In the pie a little moist dense texture and flavor so that you could hear a mile away! Be sure to cook plum cake New York Times. I'm sure you will want to repeat it several times (at least then, to try another piece - it scatters it in an instant :). *Instead, you can use coconut flour chips (then pre-soak it in warm water or milk for a few hours so that it swelled). If no chips or flour on hand there, and try the cake like :), just add coconut instead of wholegrain (or white flour). Wash plums, cut in half. Takeout 8 halves, coarsely chop the rest (eg, in quarters). Preheat oven to 180 degrees. Butter Whip with sugar until smooth (a few minutes), add the eggs one at a time, without stopping beating. All the dry ingredients (flour, baking powder, cinnamon, salt, vanilla) to connect to a separate bowl, stir. Thoroughly Stir mass with a spatula, add the pieces of plums and lemon zest. The dough is a thick, do not let that scare! Put the dough into the mold (greased or parchment laid out), and the top - half of plums, slightly pushing them into the dough. Send cake in the oven for 45-60 minutes (check the skewer), he should be well browned, and its smell is not exactly allow you to miss a moment of readiness! I hope you will appreciate the plum cake New York Times in my interpretation, and not once will please them themselves and their loved ones in the plum season. PS Incidentally, another cake (with frangipani) you can cook plums. As well as apples, pears, peaches, nectarines, etc..